Accidentinjuryexpert.co.uk is the quick and easy way to start your personal injury claim. We are a friendly and professional team of legal professionals, who will guide you though the claims process right to the very end. We understand that if you’ve been injured in an accident, you may be unable to work, and as a result you may also be struggling financially. We are personal injury claims specialists, who will assist you in gaining the compensation you need. Having years of experience, our team of no win no fee solicitors get fast results. Our specialist road accident team have been winning compensation for road users in the uk for years. We tailor our service to meet the requirements of your claim with a simplistic and friendly approach to get the compensation you deserve on a No Win No Fee system. How much compensation you recieve is dependant on the severity and the circumstances surrounding your case. So if you need help in making a claim, complete our online accident compensation claim form or call us our accident claim helpline on 0800 085 3627 with no obligation, and we'll let you know if you have a claim in minutes. We are not a claims management company. We are a law firm that specialises in a wide range of legal services including personal injury claims. Our Personal Injury Department has specialist solicitors and legal executives all committed to one very clear goal: getting the best for our clients. Accident victim? We understand the difficulties you face. Making a compensation claim because you are an accident victim and have suffered a personal injury can be a daunting prospect. We understand that our clients need to be guided through the personal injury claims process carefully but you also need to be certain that the person in whom you place your trust will ensure the very best outcome for you. Why choose us to pursue your accident claim? Millions of pounds in compensation claimed. Over 50 years in the business. Nationally based, helping victims from all over the country and abroad win accident claims. Specialists dealing with all kinds of injury claims from minor car accident claims to complex life changing accidents and multi-party actions. With Accident Injury Expert.co.uk, you get just that. Don’t believe us? See what our Happy Clients have to say about us. 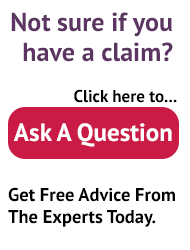 Complete our online claim form or call us free on 0800 085 3627 and let us get you the compensation you deserve.